Allen Bradley 873C-DDNP1000E2 Ultrasonic Proximity Switch. This is a surplus unused, part. Local pick up can be arranged at our Hunter Valley location. This is the TTP223B based touch sensor module which can detect a human finger touching it. 1 Button capacitive keypad. Main Colour Pin pitch When touched the module will drive the signal HIGH and put itself into touch mode. Specification of TACT switch Series. Switch Size : 3mm 3mm 5mm Right Angle type. Actuation Force ：1.3 -0.5N. Lnsulation Resistance ：>=100MΩ. Temperature ：-25°~ -85°C. 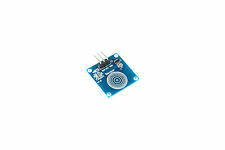 TTP224 4 Ch Touch Sensor Module Capacitive Arduino Keypad. This is the TTP224 touch sensor module which can detect a human finger touching it. 4 Button capacitive keypad. Main Colour Pin pitch When touched the module will drive the signal HIGH and put itself into touch mode. This is the TTP229 touch keypad shield which can detect a human finger touching it. Main Colour Draw Current 1 Pi Keypad shield. Rasperry Pi A . Rasperry Pi B . Rasperry Pi 2B. Rasperry Pi 3B. We apply comprehensive quality check and testing before dispatching. Sensitivity point into the system;. We apply comprehensive quality check and testing before dispatching. Sydney: 11:00-21:00 | New York: 20:00-08:00. This is the TTP223B based touch sensor module which can detect a human finger touching it. Main Colour Pin pitch When touched the module will drive the signal HIGH and put itself into touch mode. TTP229 16 Channel Touch Sensor Module Keypad Capacitive Switch. This is the TTP229 touch sensor module which can detect a human finger touching it. 16 Button capacitive keypad. Draw Current Main Colour. This is the TTP223B based touch sensor module which can detect a human finger touching it. When touched the module will drive the signal HIGH and put itself into touch mode. Pin pitch Main Colour. (Mon-Sat) Sensitivity point into the system;. Sensitivity point into the system;. Sensitivity point into the system;. Waterproof, dustproof, smooth surface;. This is the TTP226 touch sensor module which can detect a human finger touching it. LC Technology. Draw Current Main Colour Pin pitch When touched the module will drive the signal HIGH and put itself into touch mode. This is the TTP224 touch sensor module which can detect a human finger touching it. 4 Button capacitive keypad. LC Technology. Main Colour Pin pitch When touched the module will drive the signal HIGH and put itself into touch mode. Sensitivity point into the system;. We apply comprehensive quality check and testing before dispatching. Description: Proxitron IKJ-050.05G Inductive Proximity Switch 20-260VAC/DC 5-400mA 2016D New Also labelled PRO0162 (might be local inventory number). Condition: New, pre-owned, unused. In total we have 6 of these items; all are in similar condition; the last photo shows all of the items to confirm condition; this sale is for one item. The packaging (a manufacturer-provided plastic bag) is worn and dusty; it has handwriting on it. It is still sealed (stapled - we opened one for photos). LC Technology. This is the TTP223B based touch sensor module which can detect a human finger touching it. Main Colour Pin pitch When touched the module will drive the signal HIGH and put itself into touch mode. Flat actuator with red/green spot illumination. Cable Reels, Extension Cables & Trailing Sockets. Computer Cable Assemblies. Electrical, Power & Automation >. Electrical, Power & Automation. Function & Signal Generators. This is the TTP229 touch sensor module which can detect a human finger touching it. LC Technology. Draw Current Main Colour Pin pitch When touched the module will drive the signal HIGH and put itself into touch mode. IC Station Capacitive Touch Key Module Cascade TWI I2C Arduino. Multiple modules can be combined together (up to 127 others) to form a keypad in any combination you like. 1Ch Capacitive touch pins. This module is ideally suited to adding a touch interface to your project. This module is part of the Keyestudio EASY-plug range and features the series standardised connector. Further more the socket is compatible with all readily available standard RJ11 ended cables. This is the TTP223B based touch sensor module which can detect a human finger touching it. We apply comprehensive quality check and testing before dispatching. Sydney: 11:00-21:00 | New York: 20:00-08:00. Touch the light body, you can easily switch on/off. Keyes TTP224 4 Ch Touch Sensor Module Capacitive Arduino Keypad. This is the TTP224 touch sensor module which can detect a human finger touching it. 4 Button capacitive keypad. Main Colour Pin pitch. We will try our best to solve the problem for you ASAP. Exceptional durability and reliability. Actuator / Cap Colour: Green. Illumination Colour: -. Product Range: -. Product Details. Images shown are for demonstration purposes. Sydney: 11:00-21:00 | New York: 20:00-08:00. (Mon-Sat). Waterproof, dustproof, smooth surface;. Sensitivity point into the system;. We apply comprehensive quality check and testing before dispatching. Onboard TTP226 capacitive 8 keys touch sensor IC. 1 x Capacitive Touch PAD Sensor. - Onboard 8 channel level status indicator. Good quality! Excellent Service!